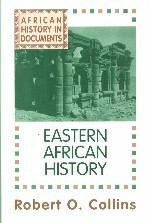 This volume covers three thousand years of African history beginning with reports about the ancient kingdoms of Ethiopia and Kush; ancient and medieval trade routes, including China’s discovery of Africa; the history of the east coast; the Nilotic slave trade; kingdoms and court life in inner east Africa; and the appearance of Indian and white settlers, and merchants and colonialists. The authors of the texts include important local authorities and scholars as well as travelers and administrators from Britain, Portugal, Switzerland, India, and China. Modern times are considered in the documents of Jomo Kenyatta, Tom Mboya, Milton Obote, and Julius Nyerere. Robert O. Collins, professor of history at the University of California, Santa Barbara, is the author of Shadow in the Grass: Britain in the Southern Sudan, 1919-1956 and The Waters of the Nile: Hydropolitics and the Jonglei Canal, 1900-1988, as well as many other books.